Texas Attorney General Ken Paxton during a May 25, 2016, press conference. 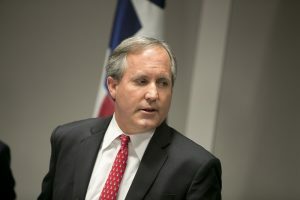 Texas Attorney General Ken Paxton is suing the city of Austin in Travis County district court, trying to force the city to comply with his reading of the state’s open carry law and allow license holders to openly carry handguns in city hall. After the open carry law took effect in January, Austin banned firearms in its city hall under the law’s “government court” exception, which prohibits them “on the premises of any government court or offices utilized by the court,” unless a written regulation or the individual court authorizes it. Paxton argues in the lawsuit filed Wednesday that Austin City Hall does not qualify for the exemption and shouldn’t be posting signs banning licensed carriers from carrying in the building or on the premises. In the suit, Paxton says a citizen complained in September that Austin City Hall displayed signs prohibiting licensed firearms. The office states it closed that case in March after the city removed the signs. In April, though, another person filed a complaint against the city because “no guns” signs had been posted,\ and people were being given oral warnings against the carrying of handguns on the premises. Paxton’s office told the city in late April it was in violation of the law. In June, the city responded, pointing to the “government court” exception. On July 5, Paxton’s office sent a “final notice of violation,” giving the city 15 days from notification receipt to “cure the violation” and send proof that it had done so. On the 16th day, the notice states, the city may owe a $1,500 fine each day it does not comply and be responsible for legal expenses the office incurs by pursuing the case. The city of Austin said in a statement it’s prepared for the fight.